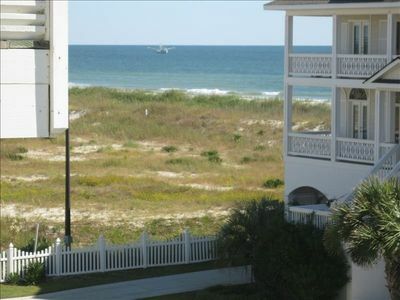 Ocean Isle Beach has a lot going for it; it's the PERFECT beach and the Seawitch is front row! 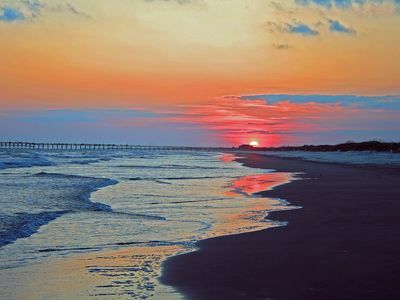 Situated close to golf courses, outlet malls, musical entertainment, great seafood, and some of the most spectacular sunsets this side of the Mississippi! Come spend a long weekend or summer week in our cosy cottage right on the water where you can sit on the front porch and watch the waves roll in. 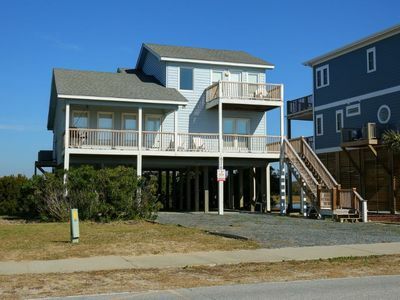 This Ocean Front Cottage on OIB is located where the island is the least crowded but the pier, puttputt, shops and restaurants are a short walk away. Property is four doors down from the very popular VBRO wedding venue/rental at 69 W. First Street. If you are coming for a wedding there, this is a great location to stay! 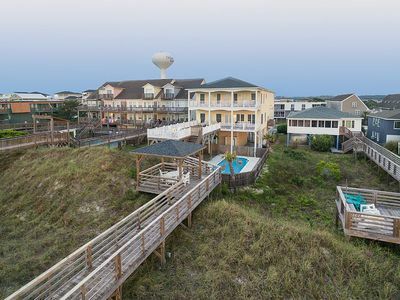 The 'Seawitch', aptly named because that is what my grandmother said she looked like as she came up out of the water from a swim, is a BEAUTIFUL, lovingly cared for OCEAN FRONT PROPERTY at Ocean Isle Beach, NC. This five bedroom cottage has two bedrooms with one queen-sized bed each, one bedroom with one queen and one double bed, and two bedrooms with two double beds each for a total capacity of 16 plus a baby bed in one of the rooms with two doubles. Each year we do renovations or improvements. 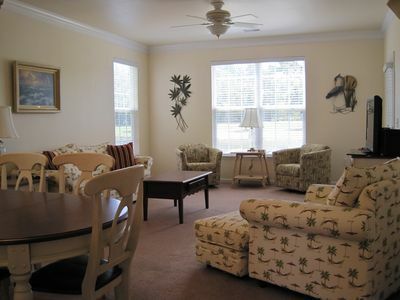 We have upgraded the mattresses and bedspreads, we recently renovated all of the bathrooms and remodeled the kitchen. This year we are putting in a new heating and a/c unit, replacing the ductwork, and redoing the ceilings. Also, on the renovation schedule is new flooring for the kitchen. 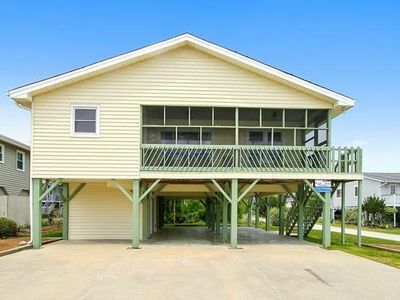 Built new with the 'old style' beach cottage in mind, the kitchen, dining area and the living room are in the middle and the bedrooms on the sides of the house. 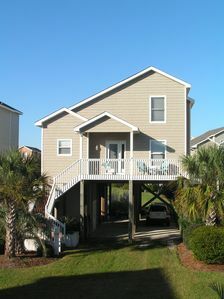 The cottage has three bathrooms upstairs and a outside enclosed shower downstairs. 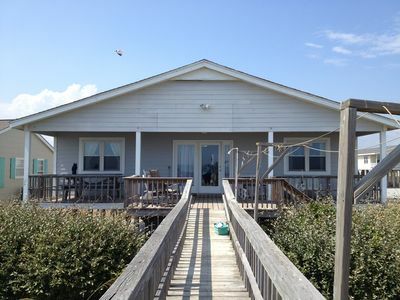 The real luxury of the house though is the front porch and deck area with its rocking chairs, picnic table, and loungers. Feel the ocean breezes flow over you as your cares slip away. Run off the beach and straight up to your cottage, take a shower in the outside shower, and sit in a rocking chair until you dry off from your swim. The clothes line is usually seen with towels and bathing suits flapping in the wind. Make yourself some 'Frogmore Stew', throw it out on some newspapers on the large dining room table and tell the kids to dig in. 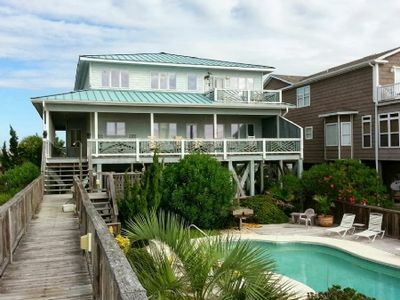 Hang up some party lights and dance on the deck to some Jimmy Buffett as the sun sets in the distance. This is the cottage to take you back to a simpler time! This house is well stocked with items that many of the rentals do not include. The kitchen is fully stocked with enough dishes, glasses, silverware, pots, pans, etc. to feed large family. My dad thinks he is Emeril so you will find all kinds of gadgets in the kitchen drawers. We also have books and movies in one of the entertainment centers for you to borrow during your stay. For all you movie buffs and sports enthusiasts, you can sit in the living room and enjoy movies or sports on the large HDTV complete with BlueRay DVD Player and surround sound. Look out the window and watch the ocean instead of the commercials! 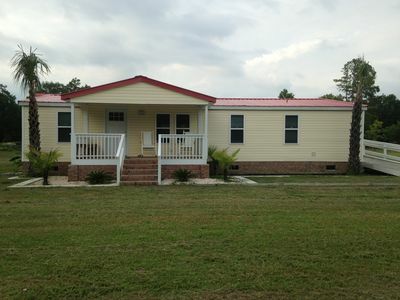 Wireless Internet and Time Warner Cable are included. There is a flatscreen TV and cable in every bedroom. 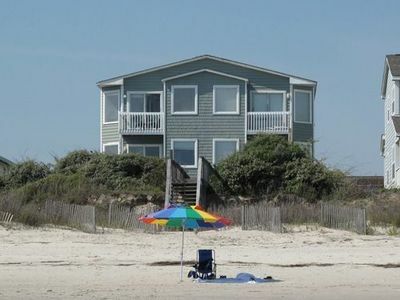 Our family has been so spoiled by this beach house that to go anywhere else is a letdown. The location is perfect, you will feel a stress let down as you cross over the bridge to the island and transition to 'island time'. 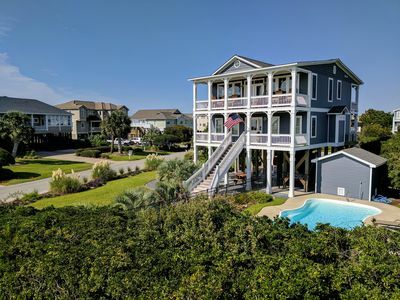 Staying at the family friendly OIB is the BEST place to be, but if you long for some night life and outlet shopping, you are only a few minutes away. 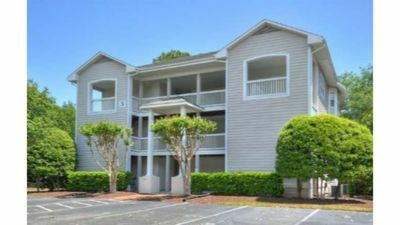 Myrtle Beach is only 20 - 30 minutes south, and Wilmington 45 minutes north on Hwy 17. 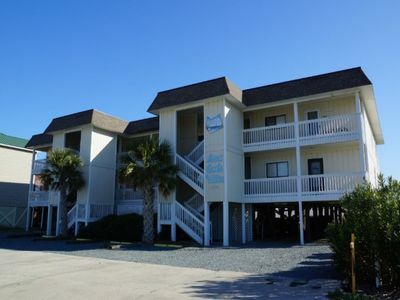 Calabash is known for the best seafood in the nation and it is a mere 10 minutes away. If you want to catch a movie, Coastal Cinemas at Shallotte is 10 minutes from your door. Golfers, there are golf courses all around you. 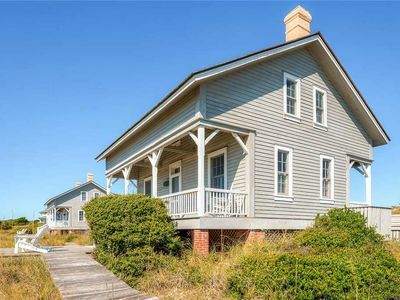 Historic Southport, NC is only 35 minutes away. 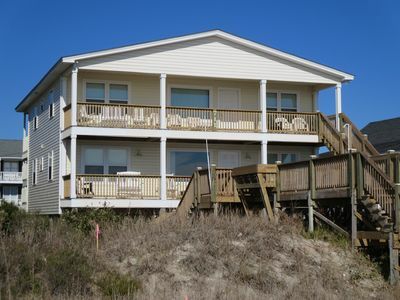 Making Memories And Enjoying Your Family At The Beach! 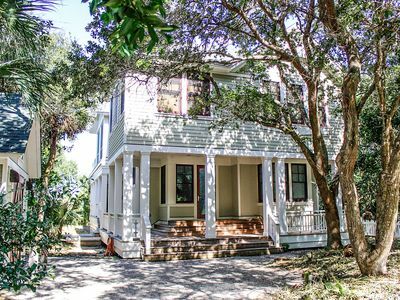 Valhalla-a Cape Fear Station sanctuary spotlighting spectacular Marsh Views! 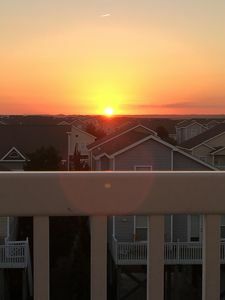 4 Bedroom/4 Bath Condo - Beautiful Sunsets! 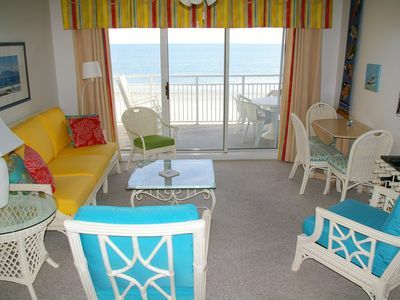 Relaxing Beach Get Away Awaits You! 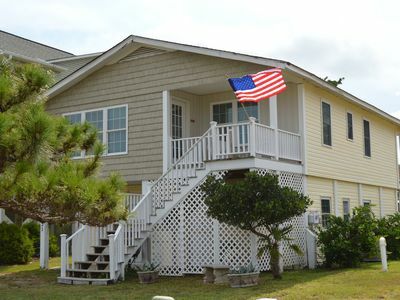 Captain Charlie's II - A traditional, historic cottage offering panoramic views of the ocean. 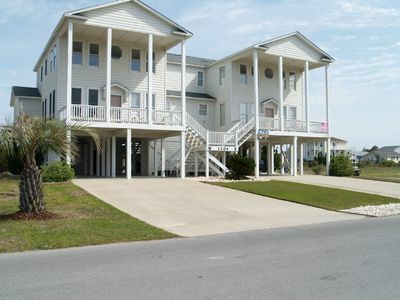 141 Ocean Isle West Blvd.